The organizational roots of South Atlantic Mennonite Conference go back to Virginia in the 18thcentury. Mennonites moved there from Pennsylvania, established churches, and functioned under the leadership of Lancaster Mennonite Conference of Lancaster County, Pennsylvania. In 1835 Virginia Mennonite Conference was formed in Harrisonburg, Virginia. As the decades rolled by, churches were established in outlying areas of Virginia and in other states. In 1957 several families moved into the Hephzibah, Georgia area, and formed the Hephzibah Mennonite Church, organized as a part of Virginia Mennonite Conference. It became the nucleus for another church in the region, the Burkeland Mennonite Church, Waynesboro, Georgia, organized in 1972. As in many church organizations, tensions were developing in the mid-1900’s in Virginia Conference over its policies. The larger part of the conference was abandoning many of its former beliefs and practices, while others wanted to maintain them. Quoting from Leaders and Institutions of Southeastern Mennonite Conference, “Because of unfavorable conditions in the Virginia Conference due to worldliness and a lack of support for the Rules and Discipline of the Virginia Mennonite Conference, the leaders of West Valley District requested a release from organizational ties with Virginia Conference on May 30, 1970.” This request was granted, and Southeastern Mennonite Conference was formed in June of 1972. SMC included seven congregations in Virginia, four in West Virginia, and the Hephzibah and Burkeland congregations in Georgia. In January of 1973 the circle of fellowship in the south expanded when the Barnwell Mennonite Church was established at Barnwell, South Carolina. These three congregations in Georgia and South Carolina constituted the Georgia-Carolina District of SMC. By the time two more decades had passed this district felt the need to establish its own conference so that the local membership could be more readily involved in the work of the church organization. In June of 1994 a formal request was submitted to Southeastern Mennonite Conference by the Georgia-Carolina district asking release from SMC for the purpose of forming a new conference. 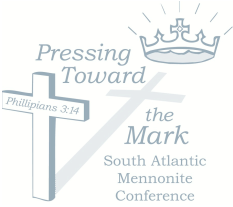 The conference body gave its blessing, and in April of 1995 South Atlantic Mennonite Conference was formed with the Barnwell, Burkeland, and Hephzibah congregations as charter members. The impetus for forming SAMC was not doctrinal or practical disunity, but a desire to have a more local church administration, enhancing the participation and loyalty of its membership. SMC and SAMC continue to jointly administrate a mission program, Puerto Rico Mennonite Council in Puerto Rico, and publish a periodical, Life Lines. Because of interest in the Jackson, Georgia area, some from the Hephzibah congregation began traveling there to conduct services in November of 199­3. At first they met in private homes one Sunday morning a month, then twice, and then in two different community centers. In 1997 the Lighthouse Mennonite Church was established in Monticello, Georgia, and a church house was built. With the passing of years the Barnwell congregation outgrew its facilities, and the membership there decided to establish another congregation in their area. Edisto Mennonite Church was chartered in June of 2012 about 25 miles to the east, close to Branchville, South Carolina, with about forty percent of the Barnwell congregation choosing to be part of the new venture. As of September 1, 2016 SAMC consisted of six congregations with 333 members. What will future histories reveal about us in twenty years, fifty years, or in one hundred years, if Christ does not return before then? SAMC has grown through the decision of our children to become members, by others who share our faith moving in from other places, and by people in our communities choosing to join with us in following Christ. We wish there were more of the latter. We welcome you to consider our faith and practice, and join with us in serving our Lord.